Humboldt State University is celebrating Black History & Liberation Month with a series of events, including a lecture by Tarana Burke, founder of the “Me Too” movement, and an open house to celebrate the MultiCultural Center’s 25th Anniversary. 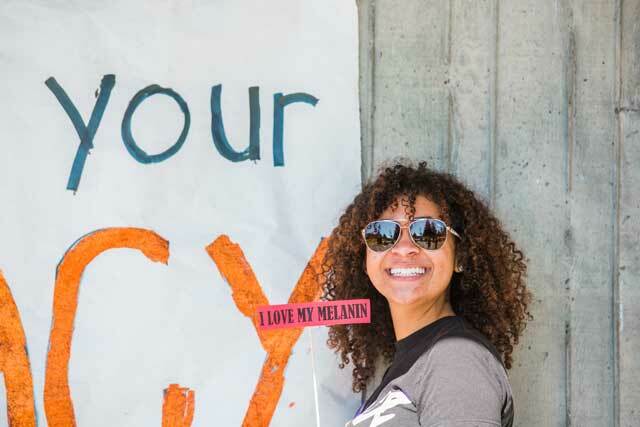 HSU Black History and Liberation Month celebrations last year included Melanin Monday on the quad. (Please note tickets for Burke’s talk on Sunday, Feb. 3 are sold out). Burke is a civil rights activist who has dedicated more than 25 years to social justice. She started “Me Too” in 2007, 10 years before the viral #MeToo hashtag campaign, to help women of color who have been sexually assaulted and abused. She’s now the Senior Director of Girls for Gender Equity. HSU’s MultiCultural Center is also celebrating 25 years of creating programming that impacts and supports HSU’s diverse student population. One of four Centers for Academic Excellence, the student-led organization is an inclusive learning community committed to retention and student success by providing opportunities for leadership development, social justice advocacy, identity exploration, and cross-cultural learning experiences. Monday, Feb. 4 10a.m. – 4 p.m. The MCC marks 25 years of service to our community! Learn about its rich history through pictures and stories. Gentle yoga asanas or poses for your soul. All levels welcome. Participants will be assisted with modifying poses for their level. Equity Arcata is hosting their seventh potluck for students! This gathering is designed to provide students with food, fun, and an opportunity to get to know some folks in the community. You can bring a dish, or you can just bring yourself and friends! Owners and operators of a local black-owned beauty supplies store will showcase their products and services. Live brow waxing demonstrations. Hair care products available for immediate purchase on-site. Come with questions about your hair and/or skin care. Celebrate Black History Month at a home game by wearing all black! The first 50 to arrive at the door dressed in all black will receive a $2 concession ticket (1 per person). Anger… Got Me Feelin’ Some Type of Way! A safe space to learn the healthy vs. unhealthy aspects of anger. Light snack provided.